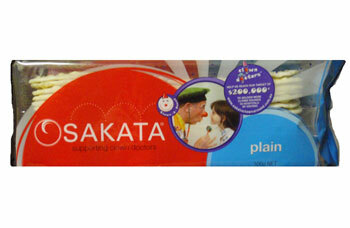 Sakata Original Rice Crackers are 97% fat free, oven baked, cholesterol free, gluten free and low in saturated fat. I absolutely love these Sakata crackers. I have complex food allergies as well as a severe gastro-intestinal condition, and these plain crackers are the only crackers I have found that I can actually eat...and they are just so deliciously tasty - my mum and dad love them too! I used to be able to buy these from Waitrose here in England, but they then vanished off the shelves. So thank you so much Sanza for stocking these as they are just perfect! Sakata crackers used to be manufactured in the UK by Walkers but were discontinued a couple of years ago. My husband has complex food allergies and these crackers are one of the few pre-packed snacks he can eat. Thank-you so much for stocking them!